Thursday July 13 1911 I cam home so discourage about Mother and so wrought up over her sufferings I grieved all forenoon I slept some in afternoon and sat on the porch with Will in evening. 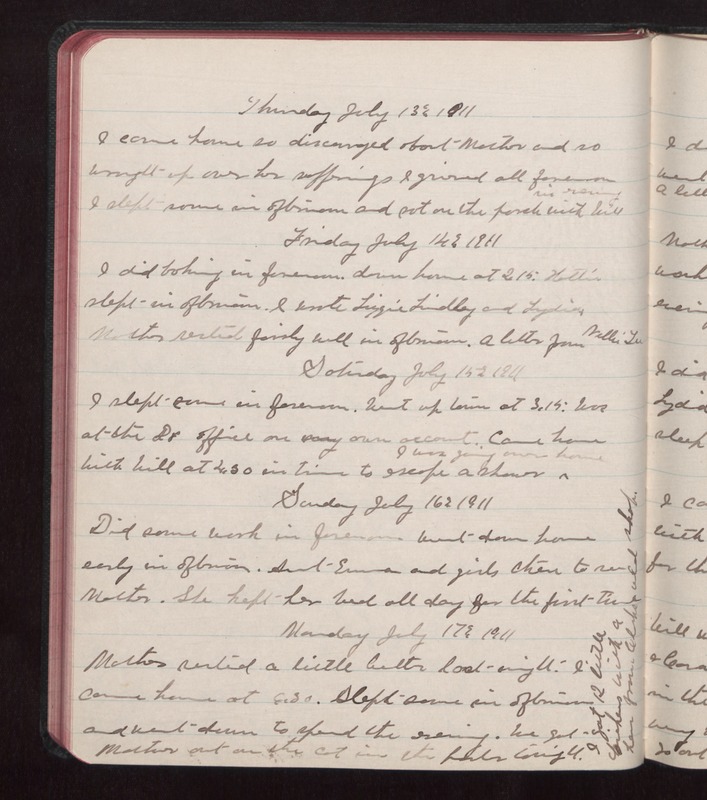 Friday July 14 1911 I did baking in forenoon, down home at 215. Hattie slept in afternoon. I wrote Lizzie Lindley and Lydia. Mother rested fairly well in afternoon. A letter from Nellie Lee. Saturday July 15 1911 I slept some in forenoon. Went up town at 3.15. Was at the Dr office on my own account. Came home with Will at 4.30 in time to escape a shower I was going over home Sunday July 16 1911 Did some work in forenoon. Went down home early in afternoon. Aunt Emma and girls there to see Mother. She kept her bed all day for the first time. Monday July 17 1911 Mother rested a little better last night. I came home at 6.30. Slept some in afternoon and went down to spend the evening. We got Mother out on the cot in the [parlor?] tonight. I got 12 little chickens with a hen from [Charles old?] shop.